The second half kicks off tonight as the M’s host the Astros in yet another series that might fit under a broad definition of “pivotal.” The M’s are 45-44 and 5 games out of the AL Wild Card lead. One of the biggest efforts of the season, to turn around a player development system that lay in ruins, is off to a great start, as this chart demonstrates. 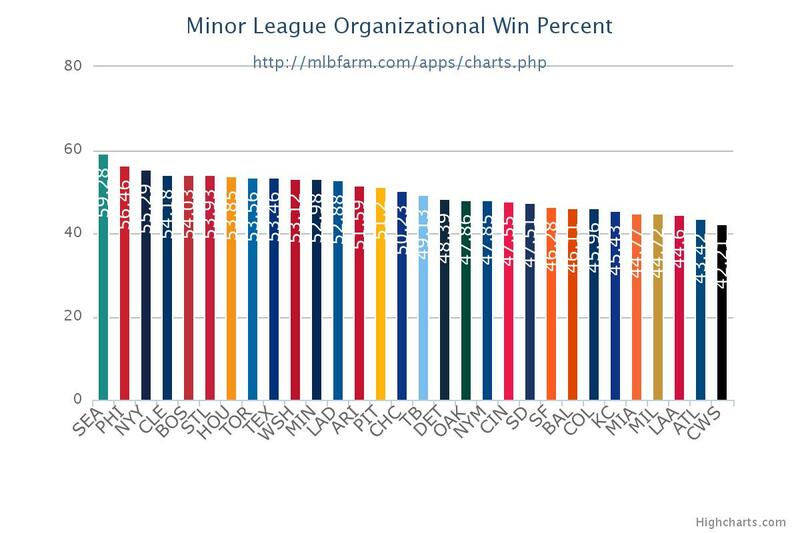 That’s the M’s, leading all of baseball in their total minor league winning percentage. Let’s just say that the chart looked substantially different a year ago. While the Fangraphs playoff odds for the M’s look fairly bleak, the picture’s a little brighter by Baseball Prospectus’ methodology. Tyler O’Neill’s development has been quicker than expected, and DJ Peterson’s back from the prospect brink as well, meaning the club has two bats sitting in the high minors that could contribute next year and/or interest some clubs with pitching to sell. You can combine all of these facts into a pretty compelling picture, and that’s just what David Skiba did in this great, optimistic piece over at LL today. I lead with that in part because I want something to break up the gloom I’m feeling. I want someone to show me I’m wrong, and hell, David gave it a good shot. The M’s *are* talented, and they’ve been hurt by injuries, and in the grand scheme of things, 5 games out of the Wild Card just ain’t that much. But I think you can make the case that the way this season’s played out spells serious trouble for the Mariners, and that the problems go deeper than their 2016 Wild Card odds. The preseason projections figured the M’s as about an 84 win team. Right now, BP figures they’ll win 84, and Fangraphs has it at 82. We’ve talked about this before, but they’ve essentially nailed the M’s. The projections have utterly failed to forecast what *kind* of AL race we’d see. The projections missed low on not just one or two but several AL teams, and to me, that’s much more troubling. The M’s had a window of contention with a team whose talent would allow them to hold off rivals and compete with other good-but-flawed teams for 83-89 wins. They could get hot and run down the Orioles or Blue Jays, but with so many teams now projected to win 89, they’re going to have to play out of their minds AND have 3-4 teams underperform to get there. What’s worse, if the projections missed low on, say, Texas and Baltimore and Cleveland, then it’s possible that those teams are further along in the development of a talented core than we thought. If THAT’S true, then we need to check out how the M’s club is constructed, and how prepared they are to compete with Texas, Cleveland, Kansas City, Houston, etc. And that’s not an optimism-inducing project. Fangraphs allows you to look at team stats filtered by age. This table shows the number of plate appearances by players 27 and under for every team in the majors. The Cubs top the list with 2,200+ thus far, the rebuilding Phillies and D-Backs come next, and a ways back, at about 2,000 even, are the Astros. The M’s rank dead last, 30th of 30, with an insane 389 PAs. Only one person who’s had such a PA is still on the club right now – SS Ketel Marte, who’s, uh, scuffled. The M’s wRC+ from their youngsters is 3rd worst in the league. The M’s do not have the depth of young talent that their rivals do. This impacts everything from their odds of making the playoffs at any point during Nelson Cruz’s contract to their ability to add pitching if they wanted to go all-in and make a run. They have one player on the midseason top 100 prospect lists from BA, BP and Keith Law. The M’s, somewhat obviously, have given the most PAs to over-30 players in the league, and those players have performed admirably, but the club hasn’t been able to fill in contributors around them, and the clock is ticking. In a few days, Adam Lind will turn 33, meaning the M’s will have 2 regulars 32 and under. It’s not so much that the M’s core players are due to collapse or anything, but that it’s hard to project a lot of improvement. On the pitching side, Felix’s incredible durability may be wearing down, and Hisashi Iwakuma’s inconsistency mean the rotation is more of a concern than it was back in April, and that’s after factoring in the chances of a breakout, finally, from Tai Walker and tonight’s starter, James Paxton. They’ve already used their best starting pitching prospect to fill a hole in their bullpen (and Edwin Diaz has been revelatory, don’t get me wrong). They can hope Wade Miley regresses, too, but it’s tougher to see them going after the big name starters on the block right now – Julio Teheran, Rich Hill, etc. – not only because their odds are poor but because they don’t have the pieces to move that other clubs do. There are a few other clubs in this predicament, I’d say. Oakland’s young core looks like Marcus Semien and a whole lot of fringe AAAA types, and while they have some depth in the high minors (Franklin Barreto), they may be in trouble for a few years, and their big trades of Josh Donaldson, Addison Russell, Billy McKinney, and Drew Pomeranz just haven’t worked out, which means fans are probably cringing now as the Billy Beane shops Josh Reddick. They’re nowhere near contention this year and don’t have the financial resources the M’s do. The Angels have money, but are spending a ton of it on disastrous contracts that increase with time, and after trading Sean Newcomb have essentially no farm system. The M’s are by no means in the worst position, but that’s cold comfort to me right now. So, uh, let’s get at it. Let’s watch the M’s try to figure out their old friend, Doug Fister. The 32-year old righty is sporting a career-worst walk rate, which, combined with a low K rate give him his worst K-BB%. He’s struggling mightily against lefties, who are slugging .534 against him. His FIP’s around 5, but he’s got an incongruously good ERA. His strand rate looks suspiciously high, but the man’s put together a very solid run, with 10 quality starts in his last 15 tries (with a couple of near-misses in there, too). He’s had a few clunkers, but he’s kept his team in the game despite not missing bats and despite his formerly pinpoint control deserting him. I think the Astros expected a poor man’s Colby Lewis (especially with Fister’s velocity continuing to slide), but he’s been a bit more like a poor man’s Scott Feldman, and given the Astros some understated, FIP-beating goodness. James Paxton can throw 100mph, but has been worth just 0.1 RA-9 WAR on the year. His FIP is a hair under 3.00, but his actual ERA is close to 4. Yes, Paxton won’t continue to allow a BABIP of .390, but if Fister and Feldman have any FIP-beating advice, I’m sure Paxton would love to hear it. Batters are hitting .352, a .406 BABIP, against Paxton’s 4-seam fastball, which, and no I won’t stop writing this, averages 98-99mph. Both righties and lefties are hitting it, and I’d love to know if Paxton’s either tipping his pitches somehow or if his new mechanics are giving batters a longer look at the ball. Some of it’s luck, but Paxton’s average exit velocity is well above the league average. It’s not a problem with perceived velocity, as his long stride means his velocity *should* be playing up. James Paxton is a solvable problem, and a hell of a lot rides on the M’s coaching staff figuring him out. A lot of prospect watchers had this game circled on their calendar, as rumors were swirling last week that the Astros would be bringing up SS/3B Alex Bregman. That hasn’t happened, in large part because incumbent 3B Luis Valbuena’s having a career year. Bregman’s got an OPS over 1.000 split between AA and AAA and has nothing left to prove in the minors, but the Astros may wait a while to see if they could move Valbuena over to 1B with AJ Reed struggling (Reed could DH). Anyway, the Astros have managed to capture the prospecting spotlight today in another way. Jesse Sanchez of MLB.com is reporting that the Astros have signed the biggest international free agent name on the market, Cuban IF Yuliesky Gurriel, for a reported $47.5 million over 5 years. Gurriel isn’t a J2 prospect – at 32, he’s expected to contribute right away, though the plan seems to be to get him a few dozen games in the minors before bringing him up. I wonder if this, too, had an impact on the Astros plans for Bregman/Valbuena. Someone’s going to need to go to the outfield, and it’s not clear who that might be. The Rainiers second half sprint is underway; the PCL’s, uh, ambitious, schedule means the R’s have a 54-games-in-54-days march to the finish line. They’ll get a boost today, as someone named Felix Hernandez starts for them at home against Colorado Springs. He’ll face struggling Brewers pitcher Wily Peralta, who was sent down after 13 awful starts for Milwaukee. The R’s beat the SkySox 3-1 yesterday behind a good start from Cody Martin. Former Rangers OF Ryan Strausborger hit his first Tacoma HR, as did CF Guillermo Heredia. Strausborger was acquired recently for some international bonus pool slot money. Anyway, HAPPY FELIX DAY. Luiz Gohara is the big prospect name amongst the other M’s affiliate starters. Kyle Hunter starts for Jackson, while Brandon Miller takes the hill for Everett. I was going to comment that it’s good to have baseball back, but not really, not like this. That was the ugliest inning of the year. this is the epitomy of how this season has been.. started out great and just went down hill from there. Oh, I forgot the season picked back up today! Looks like that’s just as well, though. I suspect the team is going to have to come to terms with the fact that the “contention based on expensive, aging veterans” window is rapidly closing. Dipoto may have to make the tough decision and start shopping out some guys in the next couple of weeks. I can’t imagine anyone would take Cano’s contract (Hey, Yankees! Lookee over here! ); but they might be interested in Cruz. So that Chris Taylor kid had a pretty big day…. for the Dodgers…. must be fun for position players to get the hell out of Seattle so they can actually be good. Also – someone needs to put a fork in Adam Lind. He’s done.